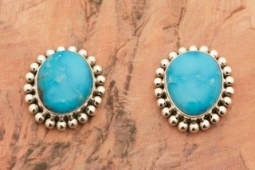 Genuine High Grade Kingman Turquoise set in Sterling Silver Post Earrings. Each Sterling Silver Bead is made by hand. Created by Navajo Artist Artie Yellowhorse. Signed by the artist.